William Floyd High School NJROTC cadets recently visited their former middle schools – William Paca Middle School and William Floyd Middle School – for an official recruiting visit to talk with current eighth graders about all the great opportunities and experiences they’ve had as members of the Naval Science program. Prospective students who are interested in the program had the opportunity to learn the ins and outs directly from the cadets themselves. The visit was particularly special for them as they had the opportunity to catch up with some of their former teachers and administrators, play some music with their younger peers and former teachers, and visit their old classrooms. 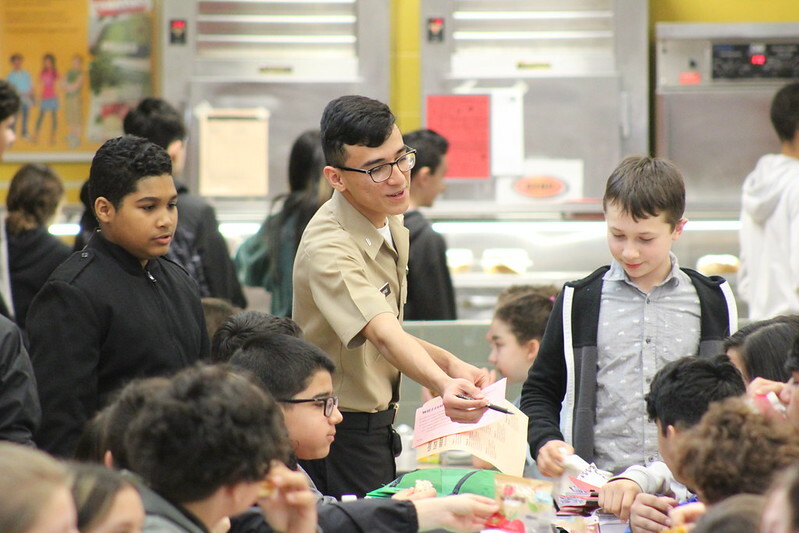 An NJROTC cadet talks to a William Paca Middle School student about the program. The four-year NJROTC program is designed to build leadership and citizenship in participating cadets. This is done through a broad social science academic approach and a practical, guided leadership experience in naval organization and administration of the unit. The curriculum emphasizes the behavioral aspects of leadership as well as the relationship of the seas to American history, world geography, international relations, and economics. Military conduct, appearance, and drill, as well as the wearing of the Navy uniform, are utilized to emphasize self-discipline and teamwork concepts. While each year of Naval Science is designed to stand independently, there is a continuity of purpose throughout the program. Each year, the course assists in building a basis for more advanced study of the Navy and sea power as it relates to the nation. This course offering is co-educational and includes extracurricular activities such as drill team, color guard, at-sea cruises in U.S. Navy vessels and visits to naval bases along the Eastern seaboard. They have other exciting opportunities throughout the school year such as marching in the New York City Veterans Day Parade. Cadets are under no obligation to enlist in a military service as a result of enrollment in NJROTC. Naval Science courses may be taken for Regents or local credit and they satisfy State Education Department requirements for a three-year course sequence. See additional photos from these visits below!